"Velveteen Vargas is eleven years old, a Fresh Air Fund kid from Brooklyn. Her host family is a couple in upstate New York: Ginger, a failed artist and shakily recovered alcoholic, and her academic husband, Paul. Gaitskill illuminates their shifting relationships over several years, as well as Velvet's encounter with the horses at the stable down the road. Mare is the story of a girl and a horse, joined with a story of people from different races and classes trying to meet one another honestly." --From jacket flap. By reputation, Mary Gaitskill is a writer not only immune to sentiment but actively engaged in deep, witchy communion with the perverse...No writer is sharper about the fickle exigencies of desire. Dominance and submission—the shifting poles that govern all relationships, not just sexual ones—are Gaitskill’s great subjects...One such child is Velveteen Vargas, called Velvet, who appears in Gaitskill’s new novel, “The Mare” (Pantheon). When the book opens, Velvet is eleven....Their greatest power struggle takes place around the question of horses. As soon as Velvet begins to take riding lessons, it’s clear that she’s a natural equestrian. Silvia is sure that she’ll fall and kill herself, and refuses to grant permission for her to ride; Ginger, delighting in Velvet’s skill and the transformative potential of her obvious excellence, secretly overrules her. Gaitskill’s extraordinary, subtle rendering of the complex physical and spiritual pulse among these people tenuously yoked together by liberal ideals touches, obviously, on tricky questions of class and race. She pushes that edge by taking on not only Velvet’s point of view, but also her abusive mother’s, and by going deeply into Velvet’s world at home, her life at school, her growing interest in the boys in her neighborhood. Now and then, things get dodgy. While I could accept that Velvet’s mother, out of rage, internalized misogyny and a twisted form of protectiveness, beats her daughter and wildly favors her son... People, in this book, lie to one another and to themselves in what they say and do, but their bodies are exquisitely sensitive instruments for experiencing the true, secret, unnameable lives of others. .. People, in this book, lie to one another and to themselves in what they say and do, but their bodies are exquisitely sensitive instruments for experiencing the true, secret, unnameable lives of others. Gaitskill delivers this visceral moment, and others like it, with full knowledge that embraces can be rough, and the people offering them are nearly always flawed, vulnerable and scarred. And yet, she insists in this magnificently hopeful novel. And yet. The Mare, too, thrives on the idea and the actuality of social collision; what it represents to us in terms of a radical challenge to the deeply embedded stratification of haves and have-nots, and how it is experienced by complex, damaged, frail, angry and desiring human beings. What lies, asks Gaitskill, in the gap between the theory and the reality?... At a crudely superficial level, everyone in The Mare behaves true to type; it is in its more subterranean depths that the mystery of attachment begins to show itself. Gaitskill is a writer who situates herself in a version of reality, and then studs it with the portents and symbols of the unconscious; the tiny box of found objects, including a broken doll that looks like Ginger, that Velvet keeps close; the news reports from the Iraq war that float from the car radio into Ginger’s agitated brain. And while The Mare is not perfect – sustaining a child’s voice is near-impossible, and the book’s adherence to an unfolding temporal narrative means that it lapses into episodic repetitiveness – it is bold, dramatic and deeply unsettling. Mary Gaitskill has numerous nominations for book awards, including the Pen/Faulkner and the National Book award. Her short stories have appeared in The New Yorker, Harper’s, Esquire, and The Best American Short Stories in 1993, 2006, and 2012. She also won an O. Henry Prize in 1998. Her novels involve emotional relationships and family tragedies. These poignant stories never fail to touch the heart. 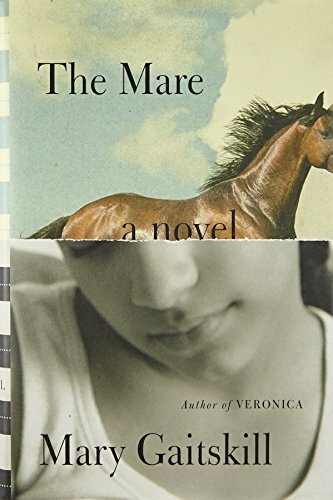 Her latest novel, The Mare, is a lovely story of a woman who has suffered a loss, but finds comfort in hosting a young, inner city girl who manages to bond with a dangerous horse. Ginger, the woman, Velvet, the young girl, and Fugly Girl, the horse, all suffered abuse. The story is told in parts by all the main characters, each of whom narrates her own chapters. Ginger and her husband agree to accept Velvet for a two-week sting in upstate New York through the “Fresh Air Fund” sponsored by New York City. In a chapter narrated by Velvet, she describes their first meeting. “They said they were Ginger and Paul. They took me to their car. We drove past lots of houses with flowers and bushes in front of them. In the city, when the sky is bright, it makes everything harder on their edges; here everything was soft and shiny, too, like a picture book of Easter eggs and rabbits I read in the third grade when I was sick on the nurse’s station cot. I loved that book so much I stole it from the nurse’s station, and the next time I was sick, I took it out and looked at it, and it made me feel better even though by then I was too old for it. I don’t have it anymore; probably my mom threw it out when we moved” (20). This stark contrast between Crown Heights in Brooklyn and rural New York is a thread which wends its way through the entire novel. Ginger is in successful recovery from alcoholism when she met Paul. They soon married and decided to have a child. Gaitskill writes, “I didn’t get pregnant. Instead my sister Melinda died. I know the two things do not go together. But in my mind they do. My sister lived in Cleveland, Ohio. She had been sick a long time; she had so many things wrong with her that nobody wanted to think about her, including me. She was drunk and mean and crazy and would call saying [obscenities] in the middle of the night” (10). This might appear to be depressing and morbid, but the silver lining of the relationship between Ginger and Velvet rose to a level of poignancy rarely encountered. Fugly Girl suffered from the same type of abuse as Velvet does from her mother. The girl and the dangerous horse developed an emotional attachment. On their third encounter Gaitskill writes, “I came home early and went to talk to Fugly Girl. Pat [the stable owner] pretended not to see me leaning right up against the door of her stall. The horse came to me and stretched her head out like she wanted some apple, but when she saw I didn’t have anything, she stayed still and licked her stall, like thoughtfully. I asked her if I could touch her nose for courage. She looked down, Oh, all right – and flared it open; quickly I kissed it” (48). That scene, that small victory of acceptance, was, probably the first shining moment in that twelve-year-old's dark life. I didn't really know much about this story before I decided to give it a try. I think I really wanted to get lost in a story that was focused on a horse. I did end up getting completely pulled into this story but I quickly found out that this story really isn't about a horse. Sure, there is a horse in the story but this is really a story about a group of people tied to one another just trying to get through life. This book was very different that I thought it would be but it ended up taking me on a fantastic journey. This story is told from four different points of view. For Velvet, this book really is a coming of age story. Velvet starts the story as an eleven-year-old Dominican girl from a poor family. She goes to stay with a family for a couple of weeks in the summer as part of the Fresh Air fund. Ginger also learns a lot about herself during the course of the story. She is a recovering alcoholic who has never had children but decides to be a host family for the program. Paul goes through a lot of changes during the story. He is a professor and sometimes is a little more hesitant to be so involved with Velvet so much as compared to his wife. The fourth point of view comes from Velvet's mother who is a single mother trying to support her two children alone in a country where she is not able to speak the language. Velvet's mom is difficult to like but by the end of the story I felt that I understood her even if I didn't agree with how she chose to do things. This book is beautiful in many ways and heartbreaking in others. I found at the beginning of the story that I really liked the parts of the book told by Velvet. I wanted hear her thoughts about riding horses and her attraction to that one special horse, Fiery girl. As I learned more about Velvet's life at home in the city, I found myself wanting to cheer her on and encourage her. Ginger took a while to grow on me but the more that I understood her the more I found myself able to understand why she was so determined to be a part of Velvet's life. She really did care about the girl and the connection between them felt very real to me. I loved the horses in the story and all of the people at the stable. Velvet's connection to the animals and the pride she had in riding them was beautifully written. The four narrators of the audiobook did an amazing job. Each voice was very distinctive and really brought the characters to life. If I had been reading a paper copy of this book, these four voices would have been exactly as I would have imagined the characters to sound. The emotions of each of the characters really came through in the narration. Velvet and her mother both were very animated and their feelings were usually on the surface. Ginger and Paul were more guarded and the narrators did a wonderful job of expressing that aspect of their personality. I think that the four narrators really worked well when everything came together in the book. I really think that they all did an equally wonderful job and liked all of their styles. I never had a favorite of the group or one I didn't want to hear. I actually think that the alternating narrators really helped the different viewpoints work well in this audiobook. I really enjoyed this story. All of the things that Velvet, her mother, Ginger, and Paul go through during the span of the story really kept my interest level high. I never felt like the story lagged at any point. The pacing was well done with parts of the book devoted to character development and others sections that moved the plot forward. There were more than a few parts of the book that made me cringe but I think that those parts really helped make the story feel more realistic. This is a book that really gets its strength from its characters. The characters in the book are all very flawed and seem very lifelike to me. I would highly recommend this audiobook to others. I think that I got more out of the story by going the audio route because the narrators really did a superb job. This is the first book by Mary Gaitskill that I have read and I plan to look for her works in the future. I thought I should read it because of rave reviews. It was a story about people and how they eke out their lives. All the struggles and challenges of growing up, fighting addiction and poverty. It's also about controlling others and thinking we know what is best for someone else. It's just life. loved this book!! read with a box of tissues. lots of complex characters battle with themselves and each other. Velveteen Vargas is of Dominican heritage. Her unhappy mother, Silvia Vargas, came to America to be married, but her plans did not work out. She was pregnant and alone in a strange country. The Vargas family lives in Brooklyn. Silvia never married and because of her disappointments she does not trust men or the world around her. Velvet lived in this world of limited opportunity and poverty with a mother who resented her presence in it, while at the same time, she feared for her safety as Velvet developed into a young lady. Silvia’s parenting skills left a lot to be desired. Coupled with her mom’s physical and verbal abuse, Velvet had to deal with the unsafe neighborhood and school environment where there were gangs and bullies. Velvet defied authority, did not follow rules and often broke them. Her school work was poor, although she was a bright young girl capable of doing better. In her neighborhood, it was an uphill battle to survive. She was not in a good place. When 11 year old Velvet goes away for a few weeks in the summer, sponsored by the Fresh Air Fund, she is coupled with Ginger and Paul. She is sent from her urban nightmare to the bucolic world of upstate New York. The Roberts home is adjacent to a horse barn where she is introduced to their world. Ginger offers her the opportunity to take riding lessons, and in exchange for Velvet working there, cleaning stalls and grooming the horses, they begin. Velvet falls in love with a mare named Fiery/Fugly/Funny Girl, pretty much the most dangerous horse in the barn. You could say the two of them are known troublemakers. Both have been abused. The reader is given a window into her coming of age as the relationship between Ginger and Velvet develops in unexpected ways over the next couple or three years. At times, it is hard to know who is being better served in the growing relationship between Ginger and Velvet, even as those around them seem to grow more distant. Both are troubled by their own thoughts, sometimes hopeful and sometimes envisioned in nightmares; their innermost thoughts are revealed as each event unfolds and they struggle with their personal realities. Ginger is obsessed with creating a better life for Velvet, sometimes losing perspective about who is the better parent, Silvia or Ginger. As Velvet learns to redirect her anger and frustration, she seems to be able to communicate with the horses. Velvet is like a “horse whisperer” as she hears them talking to her, telling her how they feel, what they want, and what they need. She begins to have feelings of her own self-worth, formerly foreign to her. Her mom does not see her as worthwhile, but rather, she says she is bad like her father; in the world of the horses, however, people praise her and value her. Her growing knowledge of the horses’ behavior with human and animal plus her difficulties in learning how to deal with the others in the barn, actually help her to better understand her own behavior and the behavior of others. Even horses want to be appreciated and loved. As she tamed the horse she loved, she also tamed herself. Silvia, Velvet, Paul, and Ginger narrate their own side of the story, and they often have contradictory views of the same situation. Each is flawed in some way, each is characterized by the secrets they keep and the lies they tell, lies of omission and outright lies. Velvet seemed to be a contradiction in terms at times, endowed with powers that seemed almost supernatural when it came to communicating with the horses. She often seemed older with regard to her attitude and views while at the same time she was woefully naïve. Both Ginger and Velvet are products of poor parenting, both have behavioral problems. Sometimes it was hard to determine “who was the adult in the room”! Loyalty to family is a major theme with loyalty to wife, mother and friends questioned. This “fostering” experiment has great ramifications on all of their lives. The exposure to a different lifestyle, other than their own, causes conflict as they truly do not understand the plight each faces in their separate and vastly different worlds. Perhaps through each other they will learn how to love and respect each other and their differences or perhaps they will face conflicts they cannot resolve. The characters, searching for love and acceptance, sometimes did not know how to show love, but perhaps because they had been abused, they did not know how to accomplish that goal. They felt worthless and powerless because their dreams and plans had been thwarted by circumstances they submitted to willingly or by circumstances beyond their control over which they felt unable to resist. I thought it was really interesting the way the author illustrated human nature by examining the way a horse is trained and reacts, by examining how Ginger, Velvet and others reacted in relationship to the animal world. Horses like people were capable of deception and affection. Cheating and lying were artifices in both the life of the adult and the child, and the reasons for their deceptions were examined as the book explored how they navigated their disparate worlds. In The Mare Mary Gaitskill attempts something that is common while also making it something uncommon: a story about a troubled youth who finds herself through an animal (the common part) that also highlights socio-economic and racial issues (the less common aspect). For the most part she succeeds quite well. The danger when addressing either aspect is to sound too preachy or to perhaps overly stereotype. I think one has to use some amount of stereotyping in order to draw attention to the larger issues one wants to address. Gaitskill manages, I feel, to not overdo it. The characters are believable in both their individuality and their location within other groups (socio-economic, racial, etc). I found the story enjoyable but did feel at times that I was having to make myself keep interest. Such a complaint can be either personal taste on my part or an element of the book itself. Yet even with this one problem I had with it I never stopped wanting to find out what happened. I would certainly recommend this to readers who enjoy such stories as well as those who like to look at stories which address the issues I mentioned. Quite a few years back there was a show on Sunday evenings called Family Classics, I remember being a young girl and watching one show about a girl who fell in love with a wild horse she named Snowfire. This began an obsession with horses that lasted many years. That is what first drew me to this book, a horse making a big difference in a girls life. This book proved to be so much more than that. Some books grab you from the beginning, others like this one creep up on you slowly. A young eleven year old girl whose mother came to the states from the Dominican Republic, living in a less than desirable neighborhood, is offered a unique opportunity. Through a program called Fresh Air, eleven yr. Old Velvet is able to spend two weeks of the summer with a family in the country. This will bring her to Ginger, a childless woman with a troubled past, and a not very solid marriage. A white woman who falls for a black child. So I wondered where this was going, how it would work out. It is narrated by Velvet and Ginger, occasionally with thoughts by Heather's husband and Velvet's mother, in alternating chapters. At first I wasn't sure I was getting to know the characters well enough, but by books end I did. I ended up really enjoying this, although I didn't agree with everyone's actions, these were very realistic characters, flaws and all. Despite outward colors, inside many thoughts were the same, insecurity, wanting love, forgiveness, understanding and a sense of accomplishment. Oh and yes, much about horses, riding and a very wonderful friendship between a girl and a horse. There's been a lot of books written about young girls and horses and of course there is the iconic film National Velvet. I am pretty sure that Mary Gaitskill wants this book to be seen as a modern day National Velvet. After all, even her main character is called Velvet although her full name is Velveteen Vargas. Interestingly, the National Velvet film is never referenced in this whole book although a few times it seems like people reacting to the character's name in relation to horses are going to mention it but they never complete the thought. Velveteen Vargas is twelve years old at the beginning of the book. She, her younger brother, Dante, and her mother Silvia live in a tenement in Brooklyn. Silvia grew up in the Dominican Republic but came to New York just before Velvet was born. Velvet's father, married to someone else, was supposed to be joining them but never made it. Silvia married in order to stay in the USA but that marriage broke up as well. Silvia works long hours as a health care aide so Velvet and Dante spend quite a few hours after school is over alone. Velvet is very good looking and also older appearing than her age. It's not much wonder that she attracts male attention when she is out on the street alone. Velvet and Silvia have a difficult relationship and the reader can't help but be shocked by the discipline Silvia hands out. It is clear that Silvia worries and cares for Velvet. So when the chance to send the children to families in upstate New York for a few weeks in the summer comes up Silvia is quite willing to let them go. Ginger and Paul do not have children of their own and, at age 48, Ginger is not likely to conceive. She would like to adopt but Paul is not sure (he and his first wife had a daughter so he has parental experience). Ginger presents the idea of fostering a child for a few weeks as a way to see if they are cut out for adoption. Velvet comes to stay with them and when Ginger suggests that Velvet might like to visit the horse farm across the street Velvet jumps at the chance. Soon she is spending hours there and she encounters the abused mare, Fugly Girl. I think Velvet sees something of herself in the horse and, for her part, Fugly Girl recognizes someone she can trust. If this was a more conventional novel Velvet and Fugly Girl might immediately bond and go on to win competitions and gain recognition and admiration from the (mostly white) horse fancying community. I have to give Gaitskill credit for not taking that easy way out. For my taste, however, I thought the time between initial encounter and end of the book was too drawn out. And some things which could have been more fully developed just got dropped without explanation (for instance there is talk of Silvia and the kids moving to upstate New York and Ginger even has them up to see a community theatre production of A Christmas Carol to show them what things the community might offer; but after that the plan to have the family move never got mentioned). Beverly's whip - are treated with exceptional grace. The story moves fluidly between the mean poverty of Brooklyn to pretty and calm upstate New York suburbia, with characters offering insights in many overlapping directions, interpersonal to the beauty of connections with horses. Over the next several years, Velvet grows up in Crown Heights, experiencing a tough, inner city adolescence. She's not a popular kid in school. Her mother is fiercely determined to protect her, but has no idea how to express love and affection for her. Her friends are on and off and unreliable; one friend is shot dead because he just happens to be in the wrong place when a gang dispute he's not a part of blows up. And she grows up upstate, spending summers and some weekends during the school year with Ginger and Paul, trading work for riding lessons and befriending Fugly Girl. Her two lives are on a collision course. Velvet's inner life is beautifully portrayed, and will connect with anyone who has had a tough time communicating with parents when you don't understand each other's issues, or been horse-obsessed in adolescence. Or, as for many of us, both. We also get shorter glimpses of the inner lives of Sylvia, Ginger, and Paul, and the stories are woven together beautifully. This is a lovely and moving story. Recommended. I loved this book. While this story had some sad elements, I found it uplifting. I wanted it to continue when I finished.